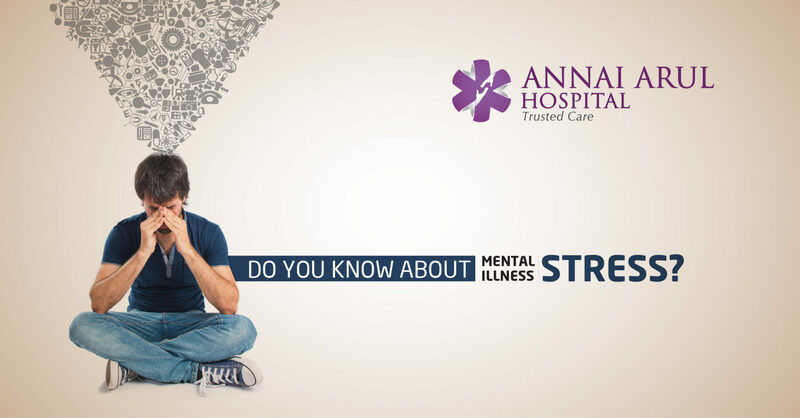 DO YOU KNOW ABOUT MENTAL ILLNESS – STRESS? According to medical knowledge mental illness is defined as a health condition involving changes in thinking, emotion or behaviour of a person. Many mental illnesses are connected to distress or problems functioning in social, work or family activities. It is apparent that many people who are afflicted with mental illness don’t want to talk about it to anyone. Actually mental illness is a condition that you should not be ashamed of and like any other health problem like heart disease or diabetes. Infact today most of the mental illness can be treated expertly. Mental illness can grip anyone regardless of age, gender, income, social status, race/ethnicity, religion or upbringing. Mental illness can take many forms, from mild ones like phobias that only interfere with daily life in a limited way to conditions so severe that a person may need to be cared in a hospital. To a certain extent stress is a natural reaction of our body to a stressful situation and helps our brain and body to react to it. If the same stress gets out of control then it can lead to mental illness. Stress can be due to various reasons, right from morning exercise, to work, school, changes in life, traumatic events like death of a dear one etc. Stress can affect our health, it is important to know how stress affects us and how to deal with minor and major stress events so that we know when to seek proper help. Which means stress can affect everyone. It has been seen that some people cope with stress more effectively or recover from stressful situations more quickly than others. What ever the type of stress it is always risky for physical and mental health. Stress can be a one time occurrence or it can be an occurrence that happens continuously for a longer period. As mentioned earlier, stress is not always a bad sign. Stress can motivate people to prepare themselves for a expected event or perform better is a life situation. Like a situation during a interview or a new job, a little stress goes a long way in improving your performance. In life threatening situations the body prepares to face a threat or flee to safety as a result of the stress response. If the stress response turn chronic or goes on for a long time it can cause major health problems. When the stress response is constant, or if the response continue even after the threat situation is over then it is called long term stress. With chronic stress the life saving stress response suppresses the immune system, causes digestive disruption, affects sleep and reproductive systems and finally proper brain functioning. This sort of physical and mental health problems will affect the efficiency and quality of life of a person. When the stress is routine then what happens is that we fail to recognise it and its effects rather than when stress is acute or traumatic. In chronic stress our body does not receive signals to return to the normal. Thus over a period of time the stress or strain on your body and mind contributes to heart disease, blood pressure, diabetes and mental disorders like depression and anxiety. Practical steps to prevent or manage chronic stress can help prevent majour health upsets in life. The following are few tips for managing long term stress. Watch for the signs: Watch how your body responds to certain stressful conditions, it will usually show signs like sleeplessness, craving for alcohol, anger, depression and feel low in energy. Have regular exercise: It is observed that you need not strain yourself but just do a minimum of 30 minutes brisk walking to feel relieved of your stress. Take to a relaxing activity: It could be a good book to read, a game of golf or just driving the car out of town into the scenic countryside and spending time there. Reset goals: Be more realistic about the goals you set for yourself decide what can be done and what else can wait. Say no to tasks if they are putting an overload on you. Always note what you have accomplished than what you were unable to do. Stay connected: Try cultivating a network of people who make you feel great and provide you some sort of emotional support. If you feel stressed talk to your friends, family and even community leaders to find a way out of it. All these will help you either tackle stress or prevent it.